I’m in Eugene at the moment, visiting my parents, so I’m using a photo from “the cloud” today. I was going through some of my dad’s photos yesterday and came across hundreds of 35mm color slides from the 1950s that he took when he was stationed in Japan. These slides haven’t been looked at in decades (if ever), but I am hoping to convert them to digital and share some here. Stay tuned. 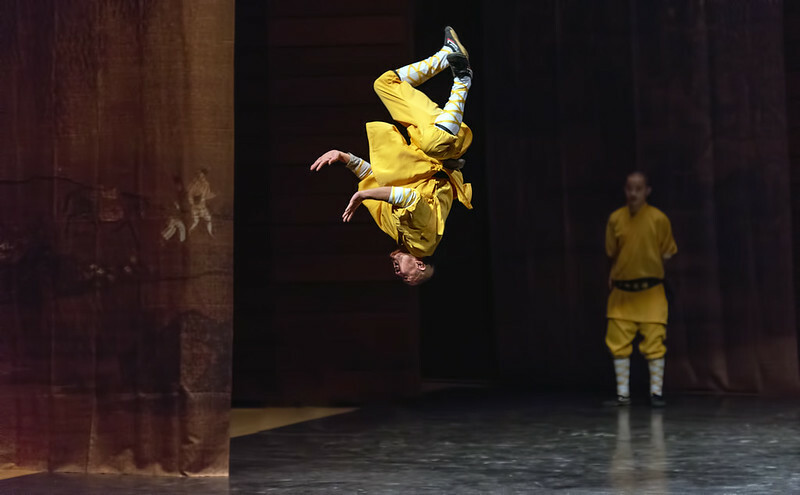 Another photo today from the performance of the monks of the Shaolin Temple which happened a week ago on the SOU campus. In addition to Chinese Kung Fu by the monks of the Shaolin Temple, Monday night’s performance at SOU featured music, history, traditions, and dance from Huaxia Orchestra of Henan Museum, a museum that I have actually been to when I was in Zhengzhou. Tonight this same show is taking place in the LaSells Stewart Center on the Oregon State University campus. If you are in or near Corvallis and plan to go, get there early. In Ashland the seats were filled within about 2 minutes of the doors opening and people were turned away. Once upon a time (less than three years ago) I visited the Shaolin Temple in central China. Last night they returned the favor and paid me a visit in Oregon. It has been a while since I posted any China pics to this blog. Today my random, desktop image was this photo from the streets of Zhengzhou (郑州). I can’t speak Chinese, but I can read some of it (for meaning). Looks like the stand behind the oranges was selling tofu, and the store on the right is a liquor store. My blog is blocked in China (as are all sites hosted on Godaddy) so I’m guessing you are viewing this from somewhere else in the world.